They’re not wireless ear buds in the same vein as the Apple Airpods - the two buds are connected by a wire which can go either behind or in front of your neck, with an inline clicker on the right and a battery cell on the left. So they sit between that super compact Airpod design and something more like the Sennheiser Momentum In-ear Wireless which uses a neck band to add more battery life. The stainless steel earbuds are magnetised, so when you’re out and about and not using them you are supposed to be able to wear them around your neck without the risk of losing them. The idea is that they stick magnetically together in front of your neck but honestly I found this feature to be sorely lacking - the magnets are simply too weak so even a gentle shake, a very light jog or sometimes no movement at all is enough to detach them. More than once while I was testing they almost fell off my shoulders without me noticing. Bluetooth 4.2 and and apt-X supply the high quality and power efficient audio connection to your devices - though missing in action are apt-X HD, noise cancellation and NFC pairing. Most people won’t miss these high-end features, and really you can't expect them with lightweight earphones like this, but it’s worth considering if you absolutely must have the latest features over lightweight portability. Note that some retail listings give NFC as an included feature but this product definitely doesn’t have NFC. It's worth noting at this point that despite the ultra lightweight design of these headphones, they're not particularly well suited to using while running or when at the gym. The earbuds will start to pop out of your ears when you introduce sweat into the equation. 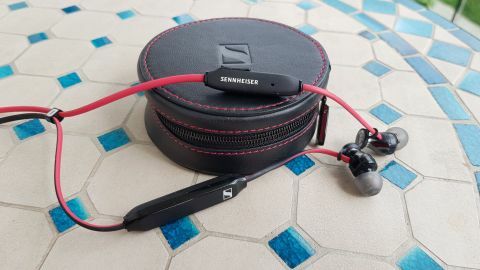 So you'll probably get away with a light run but if you're looking for a pair of ultra lightweight earphones to use at the gym there's an obvious reason why Sennheiser has a similar but separate product - the Sennheiser CX Sport. The stated battery life on the Momentum Free is 6 hours and my testing just about verified this. They’ll hit 6 hours pretty consistently and they charge from flat to max in about an hour, but don’t expect to get a cheeky extra 30 mins - the 6 hours really is a maximum. You need to be careful how you charge these headphones too - always use the supplied cable. There is absolutely no mention of this in the supplied manual but I managed to kill the first pair I tested by plugging them into a phone wall charger using a third party high capacity USB cable - it killed the battery and my first pair of Free’s never woke from their coma after that. If you stick to the supplied cable though you won’t have a problem and even a standard USB port on a laptop is powerful enough to charge them up quickly - just 10 mins will give you an hour of charge. There’s no visual battery indicator to speak of but when you’re not playing music if you give a quick tap of the ‘vol down’ button on the clicker a friendly woman will let you roughly how much charge you have, plus when you’re really low the LED will flash orange. These wireless earphones are not cheap by any measure and so it doesn’t matter how good they look (very good) and how premium they feel (very premium) - they need to sound good. They do. No matter what you’re listening to - Spotify playlists, podcasts, audiobooks, radio streams, Tidal albums - everything sounds fantastic. Balanced and detailed with just the right amount of punch and crispness. Bass is nice and tight and offers something for everyone - whether you’re a bass head or someone who prefers a more authentic flat sound, the Sennheiser Momentum Free won’t disappoint you. They’re surprisingly well rounded. The midrange is also unusually wholesome and doesn't give you that disappointing hollow sound you get from products that amp up either the bass, treble or both in the absence of true audio excellence and professional grade calibration.